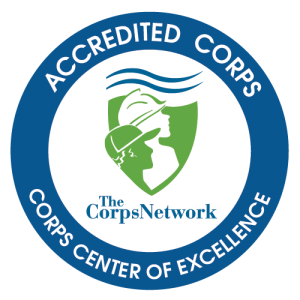 After earning an Environmental Science bachelors from Southwest Minnesota State University, Anja joined the Conservation Corps MN & IA as a crew member for the Camden crew near Marshall, MN and has been passionately engaging people with their natural environments ever since. She spent a year as the AmeriCorps Cape Cod Fire Crew Leader in close partnership with the National Park Service; served as the Corps’ NW District Field Specialist in Fergus Falls- where she earned the President’s Lifetime Achievement Award for national service; and finally served as a project host for CCMI Youth Outdoors in her time with Great River Greening as their Field Coordinator. When she’s not engaging the future stewards of our lands and future leaders, she can be found learning complex knitting techniques, smashing the patriarchy, or immersing herself in the majesty of nature.